In the current global economic environment, all countries have to make one significant decision: Do we take the necessary measures to press on with globalisation to achieve net positive benefits for all; or do we retreat from globalisation and avoid the difficult adjustments in order to preserve our near-term position? This is the fundamental question that confronts us all today. The current challenges of US-China trade relations, Brexit, protectionism and unilateralism are all a small part of a bigger trend, and they are all related to the issue of globalisation. Globalisation, as we define it, is the process of greater integration of trade flows, production and value creation chains, but that very definition will also bring about both opportunities and challenges. On the benefits side, we can easily understand how the free flow of trade, factors of production, ideas and talent will allow countries to leverage our respective comparative advantages, to grow at unprecedented rates and lift millions out of poverty. The flow of talent across borders and cross-pollination of ideas have led to an acceleration of the creative cycles for products and services. This has benefited everyone. However, the same flows of trade, factors of production, ideas and talent have also accentuated the adjustments necessary in every society. Conventional business models have been disrupted. Companies and people realise that geography can no longer insulate them from competition nor protect their jobs as it used to be in the past. Labour has to be quickly reskilled or risk being displaced by technology or more competitive sources elsewhere. Actually, what we are facing today is not very different from what others are similarly facing. What we need to do is also not very different from what others need to do. However, while there can be many good ideas, the key is whether societies can execute competently, inspire confidence and deliver consistently. The critical enabler must be a political system that consistently brings forth competent individuals and builds them into cohesive leadership teams that can put the long-term interests of our country, first and foremost, above all else. These are not easy challenges and must never be taken for granted. Social integration of more diverse people, in what were once relatively homogeneous societies, has become a source of political challenge and tension. The relative gap between those who progress faster and those who progress slower further compounds the sociopolitical challenges faced by many countries. These challenges can be found in every society. From the contradictions within Europe, contributing to Brexit; to the disparate gains between the US eastern and western coastal states as compared to the US Midwest; to the contradictions and differences between the coastal provinces of China and the inland provinces of China. What should Singapore do? The question for Singapore is the same. How should we choose to enable our people and businesses to benefit from globalisation while managing the inevitable challenges that come with it? 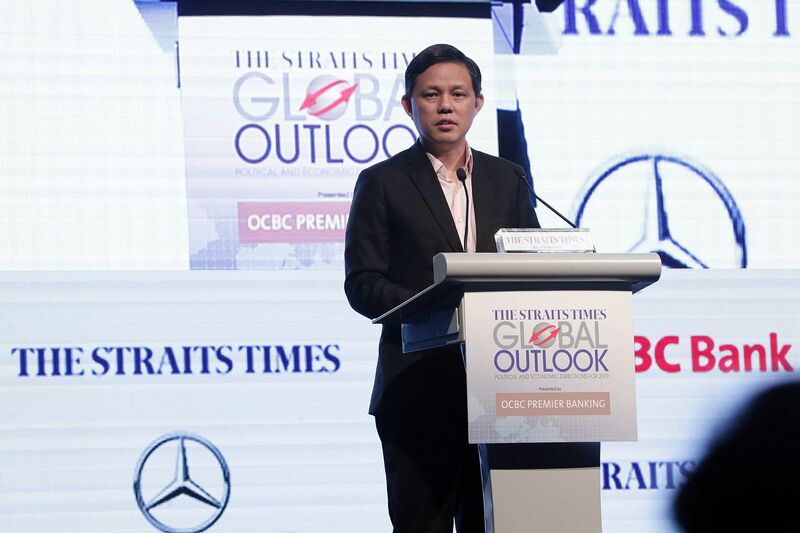 For Singapore, to close our borders to globalisation or integration with the rest of the world has never and can never be an option. For a small city-state to survive and thrive, the world must be our hinterland from Day 1. If we agree that that is the case, then the question becomes: What must we do to manage the inevitable challenges? Today, I offer six suggestions for consideration. First, we must work with like-minded countries to uphold and update the global open, rules-based trading system. Certainly, the World Trade Organisation system is not perfect. Much has to be done to take into account the changed realities for the rules to keep pace with the times. More importantly, we need to evolve new rules for the digital economy that will underpin future trade, financial and data flows. Second, Singapore must continue to diversify our trade partnerships and portfolio. We must never be held ransom or beholden to any single market for our resources, products and services. This is the reason for us to work on the review of the India-Singapore Comprehensive Economic Cooperation Agreement, Asean-Australia-New Zealand Free Trade Area agreement, China-Singapore Free Trade Agreement upgrade, Comprehensive and Progressive Agreement for Trans-Pacific Partnership, Regional Comprehensive Economic Partnership, Pacific Alliance and Mercosur. All these are things that we have done and will continue to do in order to diversify our partnerships and portfolio of trade relations. Our economic agencies will continue to work with the trade associations and chambers to expand our outreach to the various markets. Our competitive advantage must not just be the breadth of our networks, but also the depth of our understanding of the respective markets. Only so will we be able to create relevance for ourselves to the other countries and companies. The first two things have to do with the external environment. The next four things that we need to do have more to do with our internal environment and adjustment. Third, we will need to step up our investments in the next generation of infrastructure. This goes beyond our conventional and ongoing efforts to build next-generation ports and airports. It will also include new infrastructure for data, finance and professional services. Such infrastructure includes not just hardware investments but also software development like regulations to enable new technology and business models to be swiftly applied to the markets. Fourth, as we rejuvenate our current suite of industries and companies, we will also need to create new ecosystems to bring in new industries like those in the digital economy, sustainability urban and energy solutions, precision medicine, precision farming and so forth. We have at least three new canvasses at Jurong Innovation District, Punggol Digital District and Sungei Kadut - which we plan to refashion into the next high density agri-tech hub for Singapore. Fifth, we will need to equip our workers with new skills ahead of time. Our compulsory education system has and will continue to provide our workforce with the basic, foundational skills. However, our continuing education system must complement our compulsory education system to make lifelong learning a way of life for all Singaporeans. Given the technological product cycles, having 10 to 15 years of compulsory education will be necessary but insufficient for a lifetime of employment. Much of the continual learning in the future will be at the forefront of our industries, right at the edge where our companies are doing their innovation and product development, beyond the schoolhouses and institutes of higher education. Therefore, we will need to tighten the nexus and the link between our conventional education institutions with the continuing training agencies. Sixth, we will need to develop a new social compact to address the challenges of social mobility, social mixing and social integration. This is not just about inequality of who has more or who has less. We must redouble our efforts to help the slow to keep pace with the fast. The fast must see it as part of our social responsibility to reach out to those who are slower and less able, for us to progress as a society together. To build globally competitive teams for Singapore, we will need to groom Singaporeans to be able to work with the very best in the world - be it in Singapore or beyond Singapore. This is the reason for us to want to build the Singapore Global Network, where our people have the opportunities to form partnerships with Singaporeans overseas and non-Singaporeans overseas and here in Singapore. The goal is to build the most competitive team to perform and compete for Team Singapore. We must never close ourselves from the rest of the world - be it in terms of trade, financial, data or talent flows. Critical enabler It is not about shielding our people from competition. It is more about enabling our people to excel amid the competition, which is always global and never just local. Actually, what we are facing today is not very different from what others are similarly facing. What we need to do is also not very different from what others need to do. However, while there can be many good ideas, the key is whether societies can execute competently, inspire confidence and deliver consistently. We must entrench this sense of service to our nation into the DNA of our people, our public institutions and our political leadership. We have been fortunate to be able to do this for more than 50 years. This has helped us stand out from the competition. We must endeavour to hard-code this into our DNA. Globalisation will bring forth its fair share of challenges and opportunities. The challenges are not insurmountable. The ways to overcome them are also not rocket science. But the key lies in the political will and political capacities to execute the strategies well and consistently. If countries don't get this right, the local backlash will have global consequences. On the other hand, if anyone can get their systems right and overcome these challenges to realise the full benefits of globalisation, then Singapore must be one of them.